Not only can the Z1 Analyzer show you telemetry information from recorded lap, but it can show you telemetry, live, in real time. The Z1 Analyzer can show you live telemetry from any of the supported sims (iRacing, Assetto Corsa, Automobilista, Project CARS, rFactor 1 & 2, Race Room, ARCA Sim Racing, Game Stock Car, Codemasters, SimBin) as well as from the Z1 Server. Live Telemetry is an excellent way to give feedback in real time to a driver. 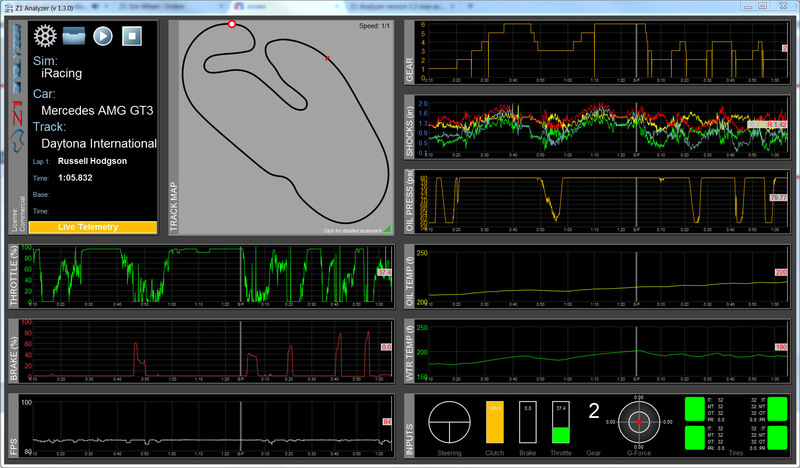 Instead of waiting to review the telemetry of a lap or session, you can view it now on a large screen as it happens. This is the perfect way to give feedback when performing driver training. Live Telemetry is turned on by going to the Select Lap dialog and clicking the Start Live Telemetry button, or by selecting Live Telemetry from the File menu. The Z1 Analyzer will then connect with the currently open sim. If no sim is open it will wait until one becomes available and then connect to that sim. To stop live telemetry simply open the Select Lap dialog again and click the Stop Live Telemetry button, load a recorded lap or exit the application. Once the live telemetry is active you will see the data from the currently displayed traces. 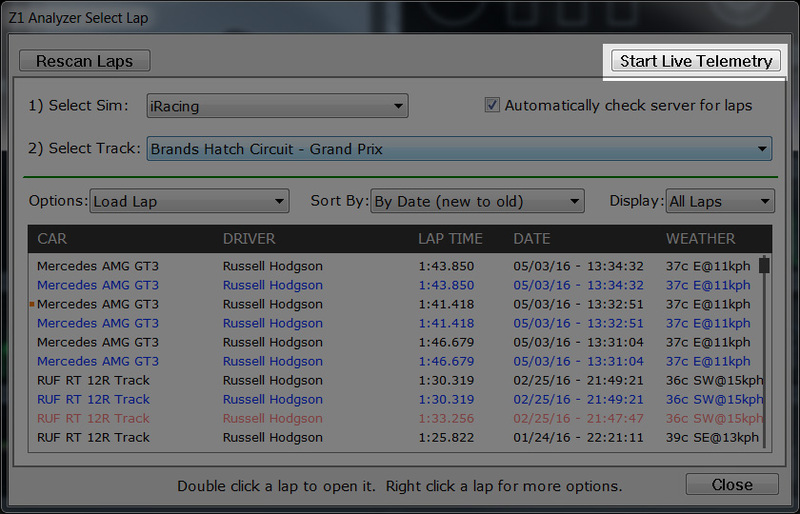 You can select the desired traces as you would for a saved lap using the settings dialog or the right click menu. If you click at the end of the trace you'll also get number for each trace so you can see the exact values of each parameter.